Imagine once again an economy in its long-run equilibrium. Now suppose that suddenly some firms experience an increase in their costs of production. For example, bad weather in farm states might destroy some crops, driving up the cost of producing food products. Or a war in the Middle East might interrupt the shipping of crude oil, driving up the cost of producing oil products. The figure allows us to perform step three of comparing the initial and new equilibrium. 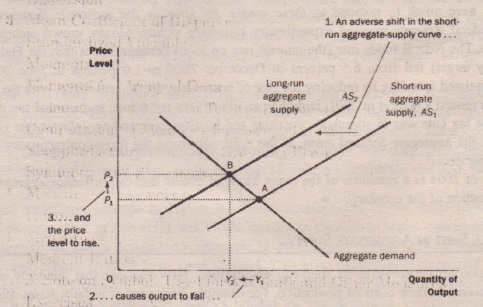 In the short run, the economy goes from point A to point B, moving along the existing aggregate-demand curve. 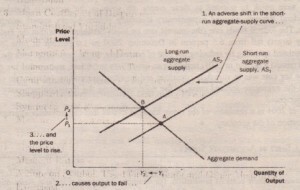 The output of the economy falls from Y, to Y2, and the price level rises from P, to P2.Because the economy is experiencing both stagnation (falling output) and inflation (rising prices), such an event is sometimes called stagflation. At some point, this spiral of ever-rising wages and prices will slow. The low level of output and employment will put downward pressure on workers’ wages because workers have less bargaining power when unemployment is high. 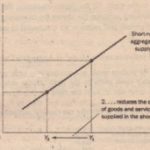 As nominal wages fall, producing goods services becomes more profitable, and the short-run aggregate-supply curve shifts to the right. 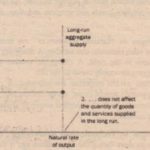 As it shifts back toward AS” the price level falls, and the quantity of output approaches its natural rate. 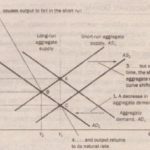 In the long run, economy returns to point A, where the aggregate-demand curve crosses the long-run aggregate-supply curve. 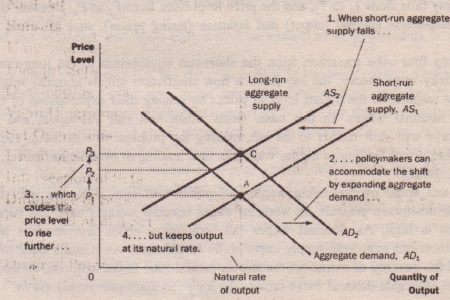 in policy shift the aggregate-demand curve to the right from ADI tc AD2-exactly enough to prevent the shift in aggregate supply from affecting output. The economy moves directly from point A to point C. Output remains at its natural rate, and the price level rises from PI to P3. 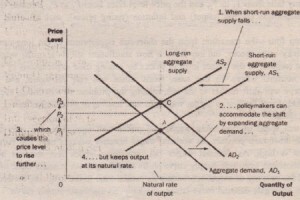 In this case, policymakers are said to accommodate the shift in aggregate supply. An commemorative policy accepts a permanently higher level of prices to maintain a higher level of output and employment.